The photographers Alexander Gardner, Timothy O’Sullivan and James Gibson set off for Gettysburg on July 3, 1863, hours after telegraphs had relayed the news that the battle had begun. Gardner was briefly captured by J. E. B. Stuart and his retreating troops in Emmitsburg, Maryland, while en route to Gettysburg, but was released after a few hours’ detention. When the photographers arrived in Gettysburg, they found battlefields strewn with corpses, and set up their cameras to record the scenes. The two most famous images of the Sketch Book were taken at Gettysburg: Harvest of Death, by O’Sullivan, and Home of the Rebel Sharpshooter, by Gardner. Both images depict the human cost of warfare in very stark terms, directly confronting a few of the many corpses the photographers encountered. 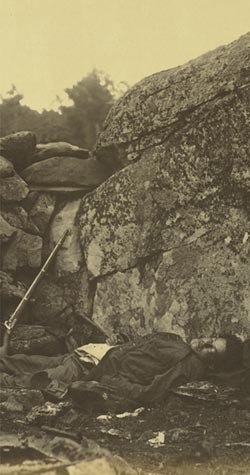 It has been determined that Gardner added a rifle from his collection of props, and moved the body of the sharpshooter to construct a more artistic composition for his own photograph. His accompanying text, written three years later, is likewise a heavily fictionalized account of the sharpshooter’s demise. Home of a Rebel Sharpshooter. Gettysburg, Pennsylvania. July, 1863. Albumen print photograph by Alexander Gardner.